Isabel Lucas is an Australian actress. You might recognize her from Transformers: Revenge of the Fallen and Daybreakers. 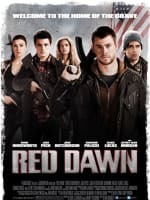 She will also be acting in 2012's Red Dawn. This versatile actress speaks English, French and German. She's beautiful. Freida Pinto and Isabel Lucas are The Immortals' lead actresses and are excited to dish their roles in Tarsem Singh's latest visionary work. The film is a visual treat and arrives in theaters November 11.